I know this is completely ridiculous (really though, when has that ever stopped me? ), but I'm writing this blog post because I'm tired of looking at the Christmas one below, it seems terribly outdated since Christmas is so four days ago and all. Not that I want to wish it away or that we didn't have a perfectly nice holiday, but I'm still tired of it just the same. That said, I'm not ready to take down our tree or pack anything away just yet. I still enjoy plugging in the lights each morning and enjoying their twinkle all day long. We usually wait until after New Year's to dismantle everything and cart it all back to the attic. I'm sure I'll be glad when that job is finished, but thinking about the task itself is rather daunting and therefore easily procrastinated. I've been on a Jane Austen binge lately, and I must say, it's been lovely. Last week I popped in Pride and Prejudice (the best version, the one with Colin) and settled in to knit while Annelise worked on needlepoint. Seven, I think, is not too early to introduce her to the goodness of Jane, at least that was my plan. She watched some, taking breaks occasionally for legos, snacks and rollerskating around the house. I also watched an A&E version of Emma that I'd never seen before, which was much better than the Gwyneth Paltrow version, yet not quite as good as the Masterpiece Theater series that aired earlier this year and finally felt up to the task of reading the novel. I think the Gwyneth version spoiled Emma for me and led to me turning up my nose at the thought of ever liking that character. I'm realizing I've been wrong, oh so very wrong. I've also realized that my blogging could be easily compared to the character of Miss Bates, whom Miss Austen describes as being, "a great talker upon little matters." I am also realizing that while I enjoy knitting, I may not be very good at it. Or maybe I just have not practiced enough. Or found my niche, IT, pattern yet. Something always seems to go wrong or get a bit off (remember my ruffle scarf last year?). I did finally finish my neckwarmer/pidge thing-a-ma-jig and one whole end of it is larger than the other, and I'm not positive, but I don't think it's supposed to have turned out that way. Sigh. 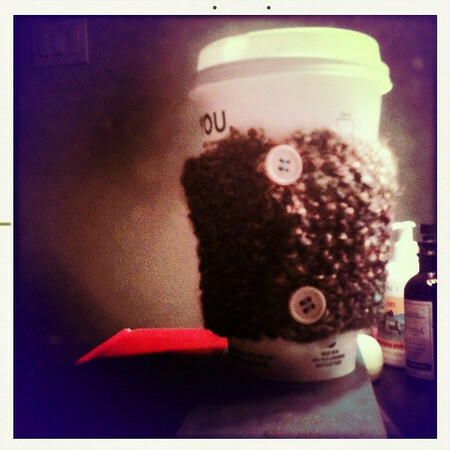 I have had some limited success with coffee cozies though. At least the ones that fit on a to-go cup. I've had trouble finding the right pattern (without cables and fancy stitches that, while lovely, I don't quite know how to do yet) to fit a mug with a handle. I think my problem is I want a project that is fairly quick to finish, because we all know I have craft ADHD, full of cuteness, not too complicated, and uses needles I already have. That's not asking too much is it? 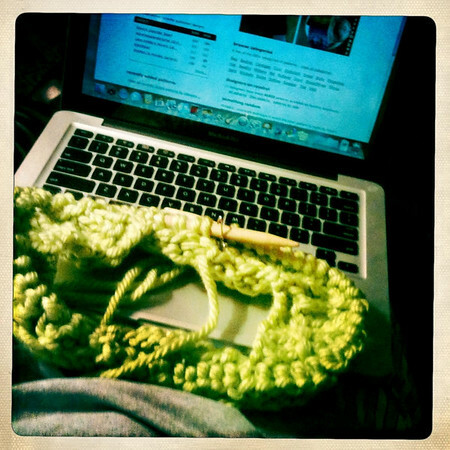 I have high hopes that it will eventually materialize into a hip, cute, cowl scarf. I have no desire to knit. I would get easily bored/frustrated/etc. I love the A&E version of P&P. My 9 yo daughter read the great illustrated classics version of the book this year and I was thrilled. One of my faves. And Emma is quite fun to read. Ah, I popped in some P&P this week, too, but the Matthew version. I'm a sucka forhis walk across the field. I love the new masterpiece Emma and the Gwynith Emma. Even enjoy the Kate Emma on occassion. But the book is my least fave of all hers. But that's not saying much. Still love it. BTW: Thanks for the darling Christmas card. It was such a fun surprise!! I had to read "Emma" for a class in college and just loved it (I'd always been too intimidated to read Jane Austen before that class), so I've always loved Emma as a character. I really liked the Gwyneth Paltrow version and have compared all others to her (though I tend to like all the versions for different reasons). I was just telling Michelle that I will NEVER be a knitter because there's too much room for error and a need for patience. I really didn't mind the Gwyneth version of Emma, but the Masterpiece version is really good. Is there another version of P&P? I don't think so. I do believe I need to meet up with you for lunch to discuss my revulsion of the new P&P. Blagh. HATE IT.